A Coast Guard helicopter crew medevaced an injured Navy destroyer crewmember near Santa Barbara, Sunday night. 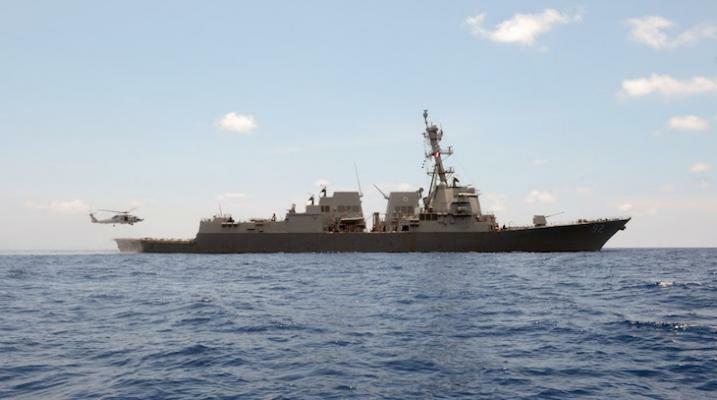 At approximately 5:30 p.m., Coast Guard Sector Los Angeles-Long Beach personnel were notified of a crewmember who was reportedly suffering from symptoms of appendicitis aboard the USS Momsen (DDG-92), a Navy Arleigh Burke-class destroyer. After consulting with the duty flight surgeon, watchstanders dispatched an MH-65 Dolphin helicopter crew from Coast Guard Air Station San Francisco's Forward Operating Base Mugu to transport the woman to a hospital. The Dolphin crew arrived on scene, hoisted the crewmember and transported her to Santa Barbara Cottage Hospital. They flew very low like a couple of hundred feet, probably due to the fog, over our house in San Roque. Likely the Coast Guard didn't know or couldn't use the normal 101 approach. Didn't realize that MH-65s are so quiet, almost as quiet as the usual med-i-vacs unless that was also due to the heavy fog. Kind of cool, glad to hear she is stable.